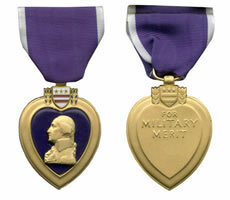 Purple Heart Day in Wisconsin honors men and women who were killed or wounded in combat. "All gave some and some gave all. So basically what I tell people is that we honor us this day but the memory and the scars continue 365 days a year." Wisconsin Department of the Military Order of the Purple Heart Commander Rick Cherone emphasizes that the Purple Heart is only awarded for genuine acts of courage, and it&apos;s important to recognize the veteran&apos;s sacrifice. Cherone explains that it&apos;s illegal to wear the medal if you haven&apos;t earned it. Bad actors lead to the creation of the "Stolen Valor Act." "Wedding crashers had the purple heart … it&apos;s a good chic magnet. I don&apos;t understand why, but … they made kind of a joke out of it so we had to get together and create legislation … the Stolen Valor Act." The legislation penalizes people who distribute phony medals and those who falsely claim to have risked their lives in combat by wearing the medal and appearing to be decorated veterans. The law restores honor and integrity to veterans who have truly earned the medal, with their courage and sacrifice. By state statute, Purple Heart Day is observed in Wisconsin every year on August 7th. People and organizations are urged to display the American flag in recognition. NOTE: A ceremony takes place Thursday, August 7, 2008 at noon at Riverside Park, Veterans Memorial Drive, LaCrosse, Wisconsin.